A gentle wind shifts the clouds and the pale glow of moonlight illuminates the water below. The cove is quiet except for the constant crashing of the waves onto the shore. Slowly the water fills with bright spots of color as the dormant noctiluca awaken and float to the surface. As more and more noctiluca stir, the cove is set aglow with a rainbow of colors. We are thrilled to announce Noctiluca, an engaging abstract game from acclaimed designer Shem Phillips. Renowned for their restorative properties, the noctiluca are desired by many healers. Players must carefully plan their path before diving into the water to collect these mysterious glowing creatures. With a beautiful double-sided game board, up to four players can compete against each other, or one player can rescue noctiluca from the tempest in the included solo mode. In the remote depths of the jungle lie the Cerulean Pools. For most of the year, the pools are tranquil and unassuming. But on the warmest nights of the year, the otherwise quiet waters are filled with shimmering lights as the dormant noctiluca awaken. Only the most skilled divers can brave the waters to collect and deliver these glowing creatures to healers across the land. Can you catch the embers of the sea? When the noctiluca surface, the pool is filled with a rainbow glow. The colorful noctiluca can cure numerous ailments with merely their glowing presence. Healers from around the world will reward the skilled divers who can catch these rare creatures. The many different noctiluca can live in harmony with each other in carefully-tended jars. You must choose your path through the water strategically to collect the right noctiluca to fill different jar arrangements to accommodate the needs of healers, who will gratefully reward your efforts. With four bright colors representing the four types of noctiluca, players can earn bonus points at the end by collecting more of one color. At the beginning of the game, each player will secretly get a favorite card. If you get the blue noctiluca, for example, you’ll earn one bonus point for each matching noctiluca space on the jars you successfully deliver to healers. 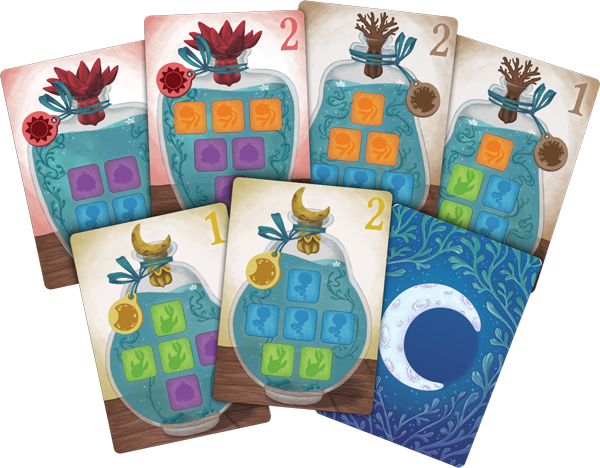 So, when grabbing new jars to fill, selecting jars that require multiple blue noctiluca will help you plan ahead to earn the extra points at the end of the game.